This is another great example of how to use containers on small, crowded lots. This city studio has an entire side that is beautiful glass. There’s no worry about there being enough light in a construction like this. Plus, a large portion of the wall doubles as a sliding door that leads out to an open patio. On the side, we see a circular window, most likely signifying the placement of the bathroom or kitchen. This rounded touch adds a fun pop of personality to the small home. And, when nature can’t be right outside your front sliding door, bringing it to you in the form of many potted plants can be a great way to spice up the wonderful open patio. One of the best parts about this home is the awning style front porch area. The design allows the owner to open and close the porch depending on the season or weather, yet also leaves another covered side patio for more regular use. Three horizontal windows that open inwards keep a youthful feel to the home, which is surely aided by the spunky light blue color of the containers. This design uses a lot of square shapes and sharp edges, as seen in the patio shape, the planting containers, and the dramatic appearance of a circular outdoor lamp. This fun home shows mid-century modern appeals with a natural twist. 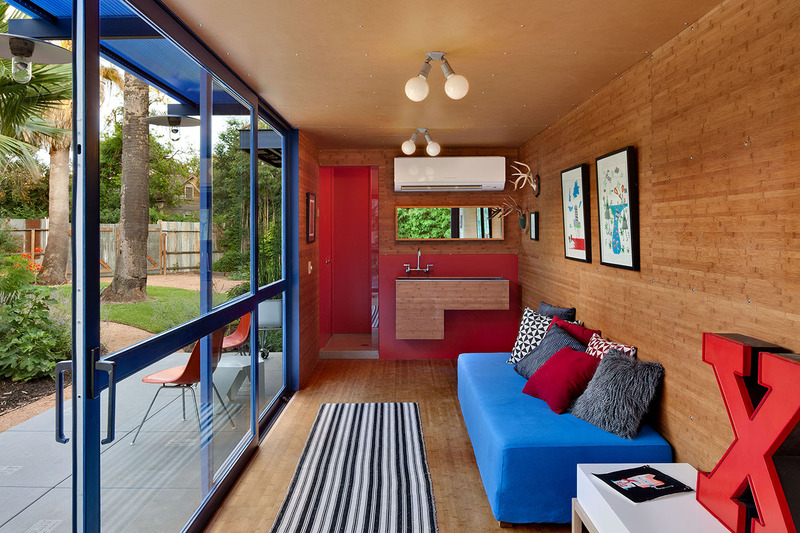 Wooden walls and a covered ceiling keep the overall inner appearance of a container hush-hush. Instead, the designed uses the long rectangle shape to create a room that focuses on the outdoors. Bold patterns on the pillows stand out against solid colors and varied fabric. Spunky antler hangers on the walls keep the space from feeling too stilted, as does the large red X. The designer has done a great job pairing colors, from full bodied browns to shades of blue and red. The indoor lighting is also it’s own statement piece, shying away from hard edges and complicated structure. 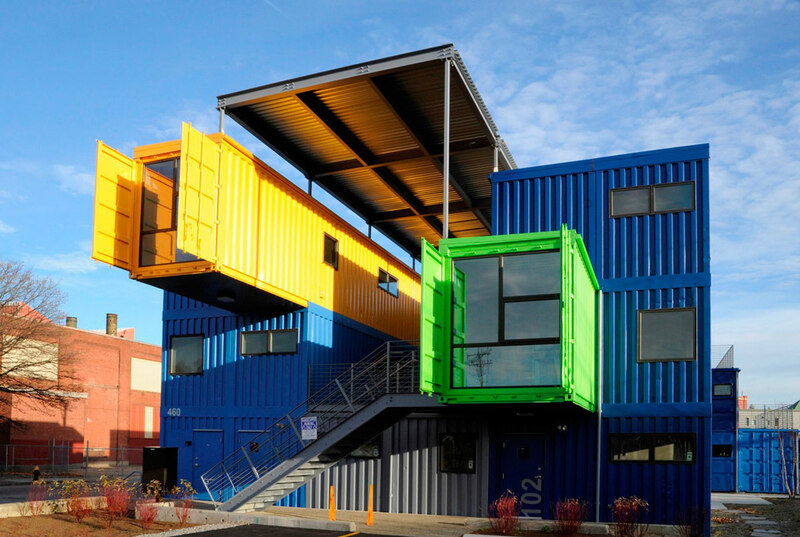 Another fun way to interact with storage container homes is by elevating them. Their durable frame makes them easy to have hanging over patios or, as in this case, lifted off of the ground entirely. The entrance stairway, with it’s nearly invisible bottom support, helps give the overall impression of mystery and other-worldliness to this house. Blocked off window design and the open entrance hall carry the eye up. The home décor continues the theme of clean edges and space by having a primarily white color scheme. The pop of inner red and black perfectly matches the outer color of the containers, a nice touch. 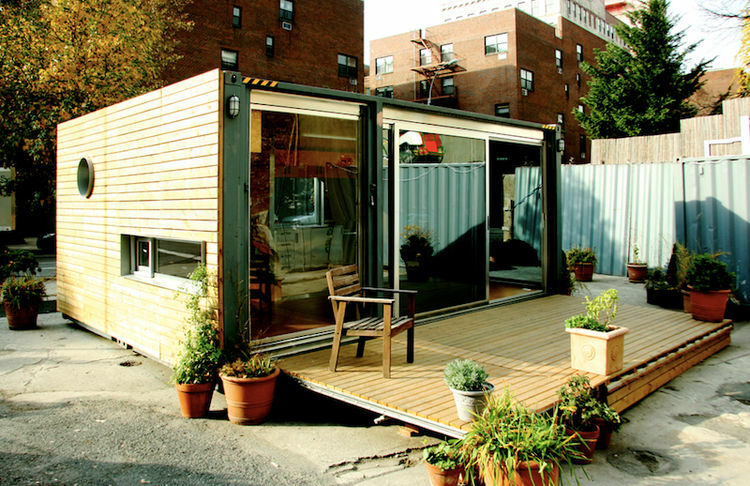 This home is a great example of utilizing storage containers in a larger space. 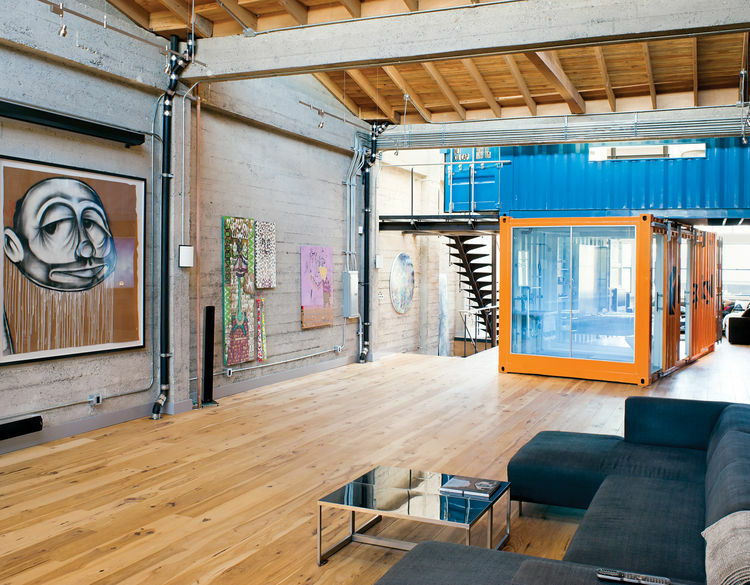 This former factory turned contemporary house has the benefit of a lot of natural light and high ceilings. What it doesn’t have are rooms or inner walls. Instead of constructing them, this designer invested in a few storage containers and created inner private space that way. The design is very artistic and enjoys the feeling of imbalance, mainly seen in the way the orange container rests a little off kilter and out of line. On top of that container, like a well played Jenga game, sits another, this one more private and out of the way. The bold color choices are an excellent addition to the natural feel of brick, stone, and wood that is already in place in the house. Buying storage containers is so economical one might be pressed to get more rather than less. In that case, build a container home mansion like the one above. This house balances the stiff appearance of solid forms and tight angles against the flowing and natural presence of the tree. Many windows lining the walls of the various rooms keep the inside bright, although the designers clearly assisted this by having the inside remain white. Floor to ceiling shades drop down to give a sense of privacy and protect from afternoon heat. The patio remains largely open, contrasting with the more enclosed feeling of the house itself. 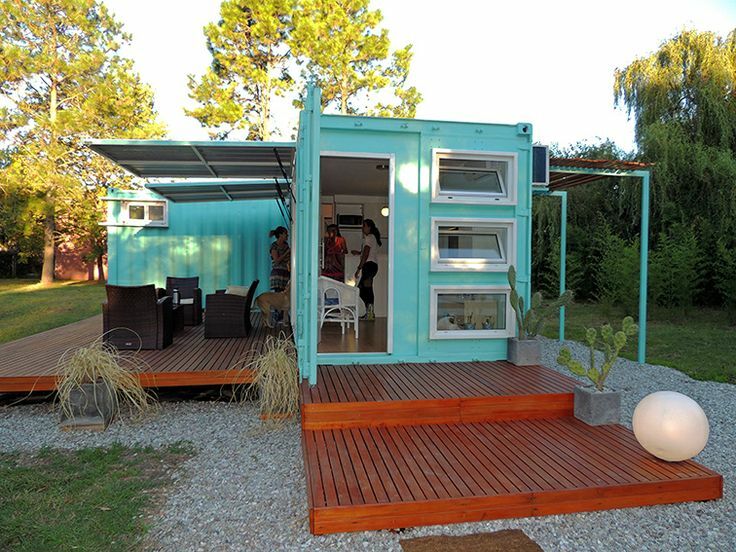 Talk about having fun with a container house. 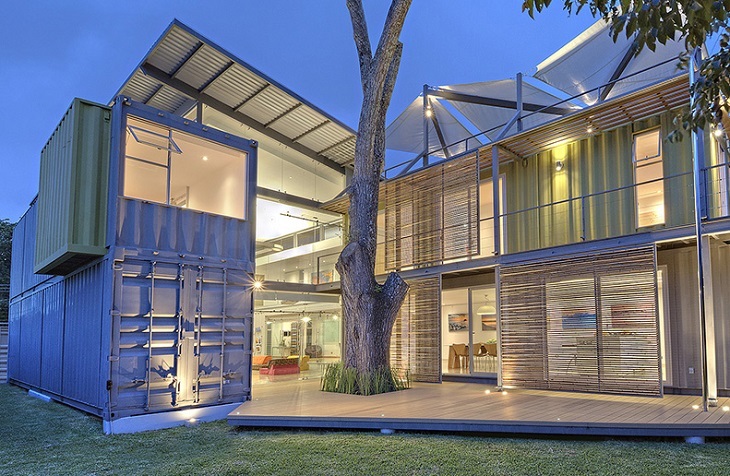 This designer clearly saw no limit in what you can do with a storage container. 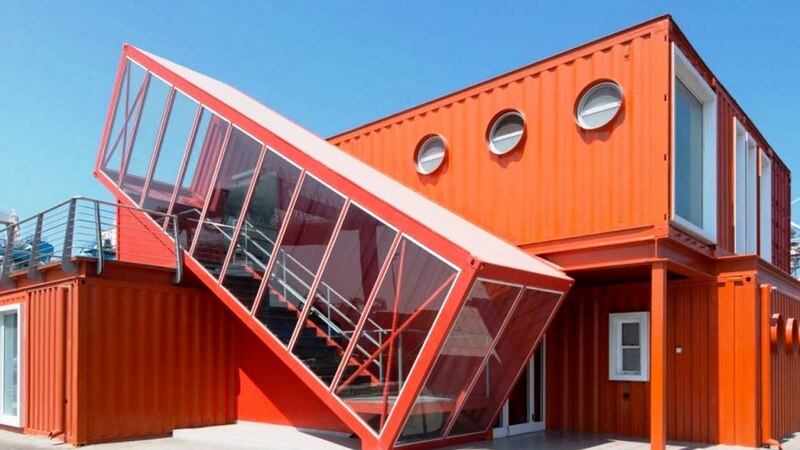 From the porthole themed windows to the upper deck with ship-like side rails, this home really went after the “ship” in “shipping container.” The fun red of the home might be too much with other designs, but with this one it actually adds to the theme and overall goal. The use of an open windowed staircase is amazing and breaks up the monotony of an otherwise quite closed off interior. 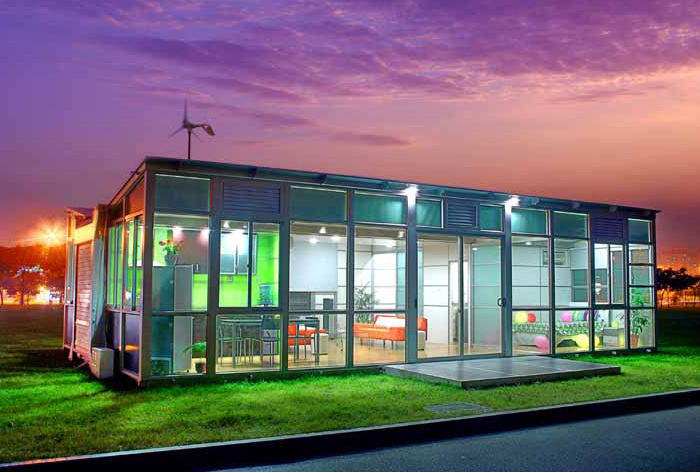 Raising the roof of a shipping container house by tilting it up on one side is a great way to add height. This home does so, but instead of keeping the additional windows open, has them covered with fabric that match the interior and exterior design. Inside, the home decor uses the rectangular shape on the walls by breaking them up into sections. The pattern only deviates to showcase a bright green accent wall in the kitchen. Even the bedroom remains open to natural light, creating an overall feel of a home without boundaries. Yet again we see a home that goes for a large and bold design and structure. 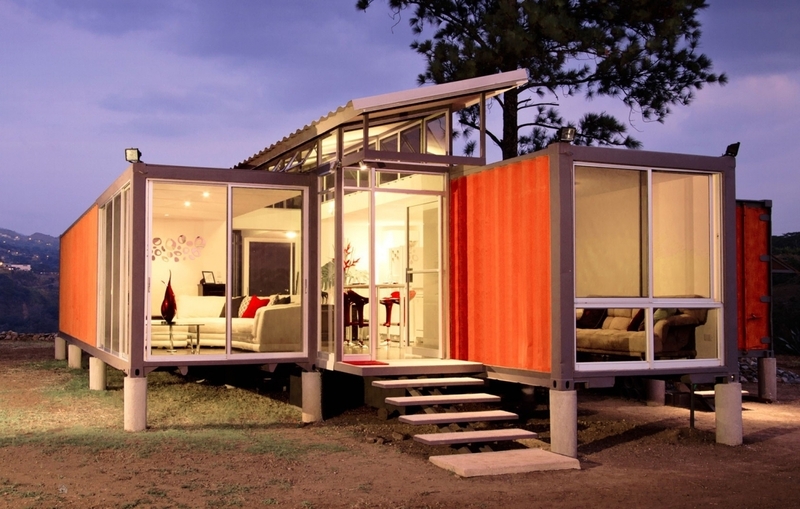 This shipping container home design uses around two dozen containers placed in a distinct U-shape. The variations to the shape and design are fun touches that leave a passer-by quite surprised at a yellow and a green container that jut out from the sea of blue. Leaving these containers open while the rest have smaller windows and closed walls is a fun way to inviting the eye towards the statement pieces. The inner covered patio section is also unique, protecting people from inclement weather, the hot sun, and curious eyes, while also giving the feel of being outside.